To create a 3D drawing of an existing building, a site visit is usually required. Blueprints for the building, if available, can be used without a visit but nothing beats a tape measure, laptop and camera for accurately getting all the details. This is especially true when alterations have been made that require new drawings for the building department. 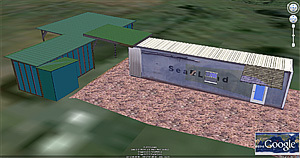 Sketchup and Google Earth are well integrated for exchanging terrain data and models, which is useful for site planning, solar exposure study of shadows for any date and time, and viewing 3D models in relation in their surroundings. A structure like the Hanalei Pier may be of community interest, worthy of great effort to texture and render in detail, but small private buildings can be located accurately and viewed in the same way.